Find artworks, auction results, sale prices and pictures of Charles B. J. Fevret De Saint-Memin at auctions worldwide. Description: Charles Balthazar Julien Fevret de Saint-Memin (New York, Philadelphia, France, 1770-1852) Miniature Portrait of General George Washington Signed and dated "C de Memin Ft./1798" along the left edge. Watercolor and gouache on paper, 2 5/8 x 2 1/8 in., in a molded gilt-brass frame with textured mat and liner. Condition: The mount with the image is separated from the frame, no obvious damage or retouch. Provenance: The family in which the miniature descended is related to General Jacob Morgan (1742-1802). Morgan was born in Berks County, Pennsylvania. He moved to Philadelphia in the 1760s and became a successful merchant. In December 1776 he was appointed Colonel and commander of the 1st Battalion of Associators of the City of Philadelphia. He fought in the Battles of Princeton and Monmouth. After the war, he returned to private business and ran one of the country's first sugar refineries. Note: Charles Balthazar Julien Fevret de Saint-Memin is credited with having made the last portrait of George Washington taken from life. In November 1798, Washington visited Philadelphia to take command of the army for the impending war with France. 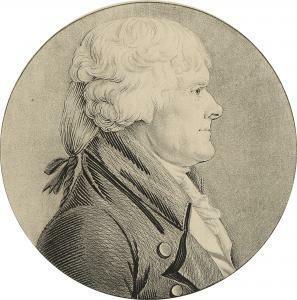 Saint-Memin was in Philadelphia at the time and made arrangements with Washington to make a portrait. The present whereabouts of that portrait is unknown. 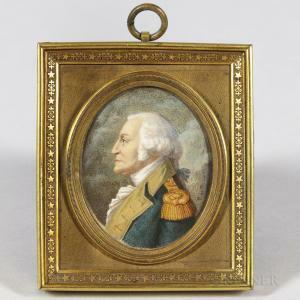 In this portrait, Washington is depicted bust length, facing to the left and wearing a blue General's uniform with buff facings and gold epaulette. The background consists of a sky mottled in tones of blue and brown. School of Charles-Balthazar-Julien-Févret de Saint-Mémin (French/American, 1770-1852), "Profile Portraits of Judge Hugh Nelson and Eliza Kinloch Nelson", 19th c., 2 multi-colored chalks on woven beige paper, unsigned, full identifications on handwritten ink labels en verso of backing boards, sights 20 3/4 in. x 14 3/4 in., black-and-gilt-decorated verre églomisé mats in matching frames. (2pcs.). 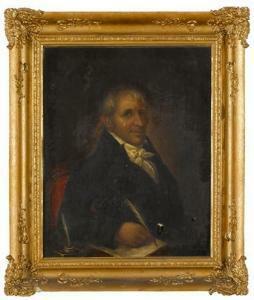 Provenance: Neal Auction, Sept. 13, 2014, lot 235. Note: These fine drawings are a reprise of Saint-Mémin's typical style, on lightly-tinted paper, at precisely his standard size; they are displayed in black-painted and gilt-decorated glass mats very similar to the originals in the State Department. The inscription labels found here en verso, evidently of the 19th c.—together with Saint-Mémin's standard small circular engraving at the National Portrait Gallery in Washington, labeled in the artist's own hand, "Nelson 1808" – tell us that Mr. and Mrs. Nelson—then respectively 40 and 27 years old—sat for Saint-Mémin (using his famous technique of the 'physiognotrace') in Richmond, during his sojourn there from early July of 1807 to April or early May of 1808. Hugh Nelson (1768-1836) was born in Yorktown and studied law at the College of William and Mary at Williamsburg. Nelson was a younger associate of Thomas Jefferson's; the latter's father, dying in 1757 when Jefferson was only 14, had appointed as his executor, and as his son's guardian, the eminent physician and statesman Dr. Thomas Walker (1715-1794), whose son John was Jefferson\’s classmate. John Walker (1744-1809), only one year younger than Jefferson and perhaps his closest friend, also attended William and Mary with him, and made Jefferson one of the groomsmen at his marriage in 1764 to Elizabeth Moore. The Walkers' only daughter Mildred was married in 1781 to a young Congressman from South Carolina, Francis Kinloch of Charleston. 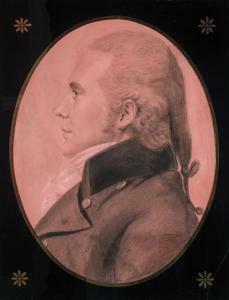 That couple had only one daughter, Eliza; she was almost the same age as Jefferson's own daughters, and given Jefferson's closeness to both the Nelson family and especially his neighbors and close friends the Walkers, it is hardly surprising that Hugh Nelson in fact married Eliza Kinloch in 1799. Hugh and Eliza (the subjects of these two drawings) moved permanently to Albemarle County in 1802, and on the deaths of both her parents in 1809, she and her husband inherited their estate, "Belvoir," where they raised their ten children. Hugh Nelson represented his county in the Virginia Assembly from 1805 to 1809, while also being a magistrate in the state's General Court; in 1811 he was elected to the U. S. Congress, in which he served for a dozen years. He resigned that position in 1823 to accept his friend James Monroe's appointment as minister plenipotentiary to the Court of Spain, where he remained until 1825. Throughout his years of public service, he stayed in close touch with Thomas Jefferson, until the latter's death in 1826; a large selection of Nelson correspondence is preserved in the Library of Congress. Hugh Nelson served a final brief term in the Virginia House of Delegates in 1828-29; he also participated on several occasions in the General Convention of the Protestant Episcopal Church in America. He was, perhaps, principally celebrated for his extraordinary recall—mainly deriving from his long friendship with Jefferson and his intimate contact with Monroe—about the lives of the Founding Fathers. Ref. : Norfleet, Filmore. Saint-Mémin in Virginia. Richmond: The Dietz Press, 1942; Miles, Ellen. Saint-Mémin and the Neo-Classical Profile Portrait in America. Washington: National Portrait Gallery, 1994; Miles, Ellen. "Saint-Mémin," Grove Dictionary of Art. Jane Turner, ed., vol. 27, London: Oxford University Press, 1996; Mapp Jr., A.J. Thomas Jefferson. Lanham, MD: Madison Books, 1987-1991; Woodfin, W.H. "Nelson, Hugh." Dictionary of American Biography. Dumas Malone, ed., vol. 13 (1934). We are grateful to Dr. Ellen Miles for her help, and (through her) to Marcie Craighill, Director of the Diplomatic Rooms of the U. S. Department of State, where Saint-Mémin's original Nelson drawings were deposited by bequest of Mrs. Thomas Gordon Greene in 2003, for providing us with current color photographs of those prototypes. 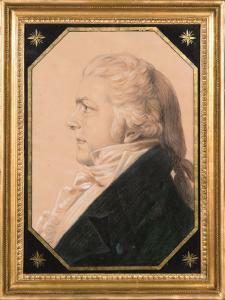 Saint-Mémin, Charles Balthazar Julien Fevret de PORTRAITS OF DISTINGUISHED AMERICANS ENGRAVED BY JULIEN FEVRET DE SAINT-MÉMIN 1770— 1852 [BOX TITLE]. [VARIOUS PLACES, INCLUDING BALTIMORE, NEW YORK, PHILADELPHIA, & WASHINGTON, D.C. 1797-1809] ILLUSTRATION: 44engravings, all except one are circular (diameter: 2 1/4 in. ; 57 mm), the engraving of William Bradford is oval (3 x 2 1/2 in. ; 76 x 64 mm), each image printed on a slightly larger sheet, mounted to 8 1/2 x 11 in. ; 216 x 279 mm leaves and matted, most portraits identified in upper left corner of matting in modern ink, some misidentified, most of which have notes with correct identification attached. Minor foxing and/or wear to a few portraits, small pink stain in lower margin of Frances Cadwalader Erskine portrait, not affecting image, but most portraits in fine or near fine condition. 20th-century red morocco hinged pull-off case, cover stamped and lettered in gilt; case lightly worn at edges and front hinge neatly separated. mixed media on paper in reverse-painted glass, oval frame, unsigned. Provenance: Knoedler-Modarco, S. A. New York; Acquired from the above in 1980; Property of an American Collection. A watercolor of James Brundige seated in a Windsor chair was done by St. Memin about 1804. The watercolor remains in a private collection. Brundige married Rebecca Worthington in 1808.